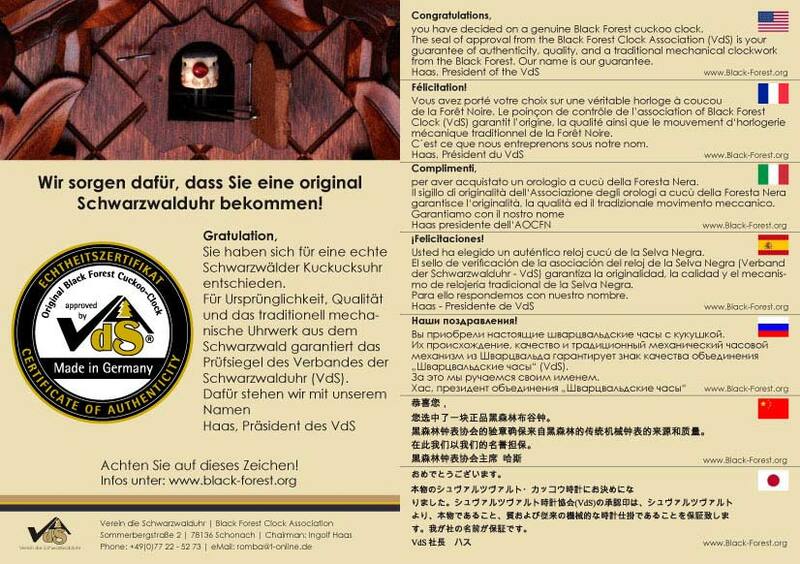 This beautiful cuckoo clock is an exclusive design by Cuckoo-Palace and is manufactured in the Black Forest. The high-quality housing is completely made of wood and measures 10 inches from the top of the little bell tower to the lowest point of the trim below the house. The idyllic scenery shows a man enjoying his bread and beer outside, while a small bird is resting nearby. Every full hour the dining man lifts his stein, and the mill wheel turns. Of course the cuckoo bird comes out of his little door as well. According to the actual hour it utters a cuckoo call with an echo, that is accompanied with subdued nature sounds. The cuckoo call is followed by one out of twelve different melodies. Thanks to a light sensor, the clock runs with all these functions only in full daylight, while in the dark it runs without sounds, and with no movements but the hands and the pendulum. Optionally the clock can be switched to silent mode during daytime with help of a provided lever. The clock is operated by customary batteries.